The days of enormous computers and huge medical devices are nearly over — as technology advances, it shrinks, and in no field is that more useful than in healthcare. Smaller tech means more mobile and agile medical services, which in turn means more options for patients and providers alike. Tablets fill this role nicely — they’re thin, sleek, touchscreen, and the right tablet has decent power, too. However, there are some pitfalls to avoid. While an iPad may be a familiar platform for many users, Apple’s hardware and software is propriety and a closed environment. Guarantees of compatibility are slim, and chances of customization nil. On the other hand, a medical tablet that can run PC software is going to play nice with most apps and programs designed for medical use, and can more easily talk to and interface with existing desktops and laptops. Plus, over 79% of clinicians are already familiar with tablets and make use of them daily, so training time is decreased. The following medical devices, and their manufacturers, can all benefit from the addition of a tough, compact, purpose-built medical grade tablet. Physical therapy is an already exhausting experience, but it can be improved with the use of the latest technology. A readily available medical tablet in a therapy room can provide both patient and clinician with useful resources like instruction videos and therapy logs. As a bonus, these tablets can also be used for telehealth and at-home PT. Apps like PT Pal Pro and Pain Therapy allow both parties to keep in touch, for the physical therapist to suggest and send exercises, and for the patient to be guided correctly through each motion. An embedded medical tablet can also be used to power the programming behind physical therapy machines. Rehabilitation robots are designed to use their arms to help patients make perfectly repeatable, precision movements that even an expert physical therapist would be unable to match. The robot’s perfect ability to guide a patient through an exercise requires an integrated tablet with both power, durability, and portability – these robots are all about movement, and having them plugged in and unmoving just doesn’t work. Medical imaging is evolving, expanding, through the use of cutting-edge techniques like ghost imaging, portable ultrasound, and advanced AI analysis. Of course, imaging machines like MRI, Xray, O-Arm, and others require an integrated computer to function at all. Both of these factors are creating a demand for medical computers that can plug-and-play into medical devices without a lot of hassle or compatibility issues. A high-definition 4k medical computer or medical monitor provides the kind of clear, full-color imaging required to take detailed pictures and video, and it does so without sacrificing durability and the longevity required by modern medical budgets. 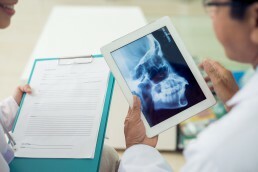 Tablets and battery-powered medical all-in-one PCs also provide a huge boon to mobile imaging applications like dental, gynecological, or radiological trucks, either for rural or urban use. Since battery-powered medical tablets, monitors, and panel PCs often have redundant battery bays and a long time between charge cycles, they can run imaging machines with no problem for great lengths of time without going near a power socket. A telepresence robot is a new concept that has been cleared by the FDA and may start appearing in more healthcare facilities soon. They’re designed to provide some telehealth relief to patients and crowded healthcare providers alike. With a known shortage of doctors and nurses, it’s time to explore alternatives to keeping patient care at its highest levels. Controlled by both an embedded medical tablet and a distant tablet or medical computer, telepresence robots are designed to give patients facetime when they might otherwise have been waiting for treatment. Doctors can diagnose and treat patients via the use of these robots, though they are most often used for remote consultations with distant specialists. It can save the specialist a long car, train, or plane trip, while at the same time getting the ball rolling on the patient’s healthcare plan in the meantime. These medical devices can obviously benefit from integrated medical computers. Instead of a consumer model of tablet or other computer, the telepresence robot can maintain its IP65 and 60601 rating with minimal effort by using a medical tablet for long-distance communication. Nearly two decades ago, the FDA approved the use of the da Vinci Surgical System, a massive surgical robotic suite that surgeons use today to fine-tune their incisions for greater patient care. Traditional surgery has relied on steady hands and proper instrumentation, but with systems like these, patients have seen a drop in significant problems. Using sophisticated controls and a surgical monitor that magnifies the surgical site, doctors can manipulate several arms above the patient that can carefully incise and stitch up areas of the body. The result is reduced blood loss, shorter recovery times, and fewer health complications. It’s great for cosmetic reasons too — surgical scars are less apparent because the arms create tiny holes instead of large incisions. 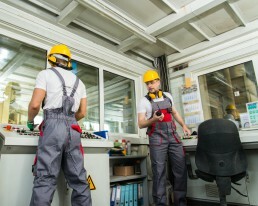 These systems, and others like them, require top, medical grade panel PCs or medical monitors that can be integrated within the machine itself. And since the robot-assisted surgery equipment goes inside the operating theatre, it must conform to stringent guidelines. A medical grade panel PC can be integrated easily, and its antimicrobial case and fanless design fit all the IEC/EN/UL60601-1 requirements needed to work safely near patients and in surgical environments. Medical devices and medical computers make for excellent partners — why reinvent the wheel in having to design a PC around an existing device, and why deal with the failures of consumer-level computers and less-regulated standards. 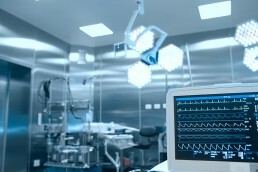 Visit Cybernet today to learn more about how to integrate medical tablets and medical computers into any existing medical device.